We’ve got our eyes on 15 of the HRM’s finest pies. While Alexandra's can now be found in locations all across the HRM, the Queen Street location is the original, opening in 1991. 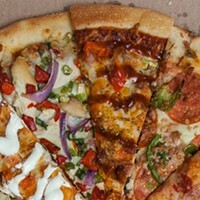 For many it's the first name in poutine, but Alexandra's wide range of pizza is where its passion lies. Freshness is important in its literal A-to-Z of toppings, including Saputo meats and a garden of vegetables that top pizzas like their Heart Smart vegetarian. But the folks at Alexandra's are firmest in their belief that the secret to great pizza is a combination of sauce and dough, so theirs is made from scratch every day. There’s an R in a circle after Home of the Big Slice, so this is serious, you guys. (Is this really a registered trademark?) 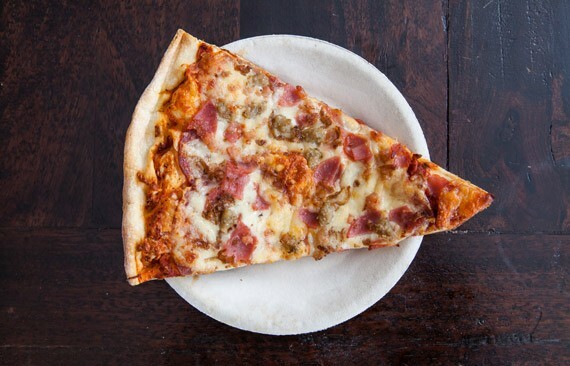 The Sicilian is so famed for its giant slices, that people likely think of triangles before they think of circles when the think of the pizzas there. The Sicilian still holds court at Pizza Corner, but you can also get its pizza in Clayton Park and Fairview and up on Quinpool Road. Sicilian basically blankets the peninsula at this point, but then again you’d only need a slice or two to do just that. After growing up in the pizza biz, Pierre Karam has recently taken over Velos (which served fresh pies from Bedford and Elm Street before moving to Almon) from his father, bringing new energy and web presence to the joint that’s been selling za and donairs since 1970. Velos is never stingy on the toppings, which is why customers return for faves like the donair, The Works or the newer Taco pizza. But Karam says the secret to perfect pizza is “having the right dough recipe for your oven,” which in Velos’ case is a decades-old formula and a stone oven. Somethings to watch for at this popular spot in the north/west end: gluten free crust could be in its future, and if you spend $25 before tax on Monday, Tuesdays and Wednesdays, you’ll get $4, $3 and $2 off, respectively. 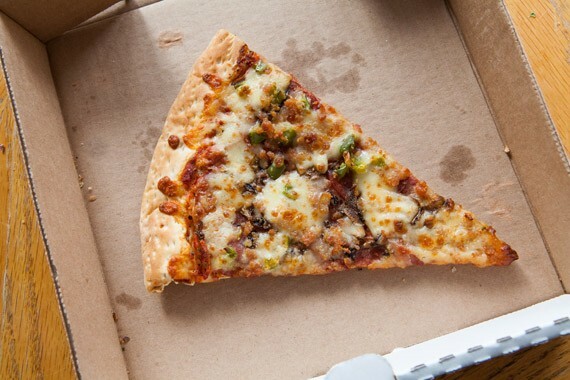 We first heard of Pizza Time from old friend from Cole Harbour, who’d make the trip to Pleasant Street, passing a handful of closer pizza joints, to pick up his Friday night pie. This place is a thing of legend, the type of restaurant you feel like you’re in the know if you know about it. Tucked into a building you’d barely notice while cruising Pleasant Street towards Eastern Passage, this beloved pizzeria has been building its fanbase since 1983. 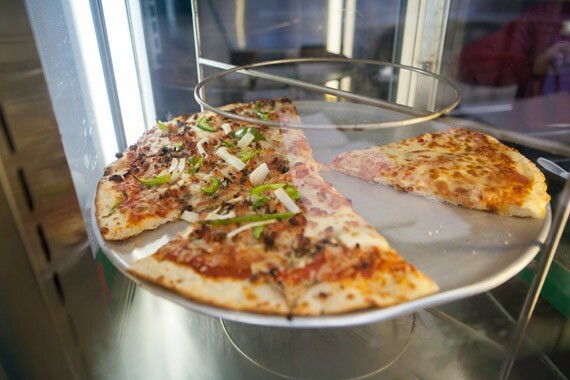 But it’s not just the simple-but-quality pies, the fried chicken, subs and poutine that have won over a reliable crew of Pizza Time worshippers---each dish comes with an extra helping of memorably friendly service. Tomaso’s covers all the bases, with standard pizza, gourmet pizza and Italian pizza. It highlights bright flavours on its pesto sopreso pizza, which features sun dried tomatoes, roasted garlic, basil and pine nuts along with a blend of mozzarella, feta and asiago cheeses. Tomaso Prato’s Italian heritage is perhaps the most important part of this 45-year-old restaurant’s recipe for success. 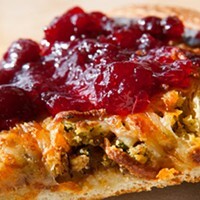 The family pizza recipe, fresh toppings and secret sauce have endured the years. 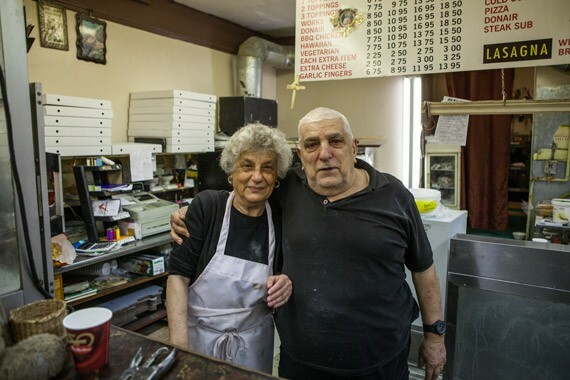 Leo and Samira Kharma have been running their unassuming north end pizza shop, convenience store and neighbourhood hangout for 38 years. For nearly four decades this family business has been the serving up the same made-from-scratch pies, using the same recipes and earning its place as a Gottingen Street institution. And these are some of the sweetest deals you’ll find in town (not just pizzas either, a small donair is $3.95!). Because you can grab cleaning supplies, cookies, cigs and milk along with your pizza, there’s a steady stream of regulars (many on a first-name basis) coming through these doors. In fact, we’d wager a guess that just as many folks pop in to say hi to these lovely entrepreneurs as they do for the pizza. Peter’s has been tucked into the south end on Inglis Street since 1973. Its mandate is to keep it simple and do their best to make classic pizzas. The thin crust is always baked to perfection, airy and blistered, and they are nothing if not generous with cheese---this is the kind of pizza that would make the hearts of Ninja Turtles soar. Peter’s Special hits all the classic buttons---pepperoni, bacon, onion, mushrooms and green pepper---but the garlic-basted crust on their Canadian Classic is hard to resist, too. Open for over 30 years, Revana holds down its place on colourful Portland Street and brings scratch-made pies to downtown Dartmouth. Revana’s claim to fame is simplicity: the pizza is made from scratch, and the sauce is made with hand-crushed tomatoes, with a house recipe. The dough is also made fresh daily, spiced with a secret ingredient that makes it all the more special. You won’t find a can in the joint. 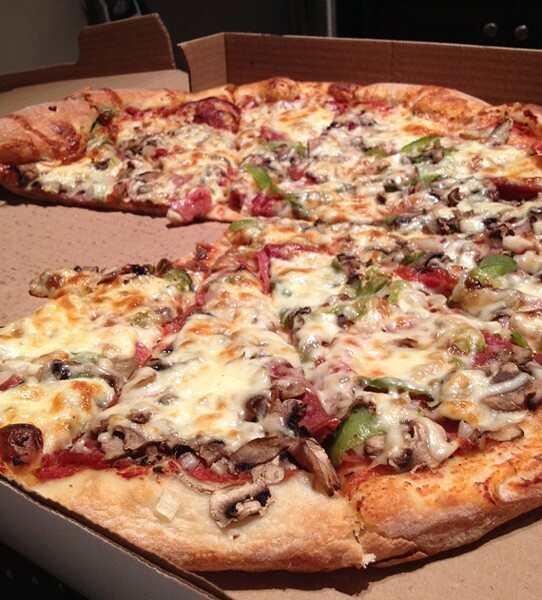 Revana’s works pizza---a combination of salami, pepperoni, bacon, mushroom and green pepper---is a true classic. 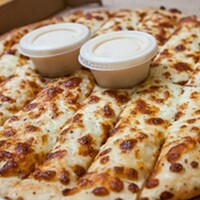 If Metro Pizza isn’t on your speed dial yet, you better get programming. It’s been making drool-worthy pizzas for 20 years, but if you don’t frequent Lady Hammond and Robie (to perhaps indulge in a visit to Cousins?) you might not know about this golden nugget. It comes very close to being Cape Breton pizza (a very good thing), with perfectly charred crust bubbles, a generous distribution of topping, a browned layer of cheese and narrow enough slices to accordion fold into your mouth. And while Metro says the ol’ reliable pep and cheese is its most popular pie, the Metro Special (pepperoni, mushrooms, onions and green peppers) is something to write home about. Euro Pizza took a little piece of this heart a long time ago. It’s a place where dependable delivery pizza and gourmet pies meet in the middle and a classic “all meats” (pepperoni, salami, bacon, smoked sausage) is just as great as the fancier pesto pizza (grilled chicken, red onions and sun-dried tomato pesto). But the rest of the menu comes very close to out-shining the ’za. The chicken dinner’s a hell of a deal (with an addictive authentic Greek salad, pita and housemade tzatziki), and the yogurt (also housemade) will make you regret ever eating the store-bought stuff. Open for 24 years, Lawrencetown Grocery & Pizza always go for grade A ingredients, eschewing low-quality toppings for Saputo. Its pies are of the classic variety, focusing on crowd-pleasers like Cheese Lovers and BBQ Chicken pizzas, but getting a little crazy with a spicy number that’s topped with Brothers pepperoni, ground beef, hot peppers and green pepper. Its slogan is “often imitated, never duplicated,” but King of Donair itself has managed to duplicate its own success all over Halifax. Open since 1973, KOD used to hold down a slice of Pizza Corner, but now has two locations in Halifax along with one in Sackville and another in Dartmouth. 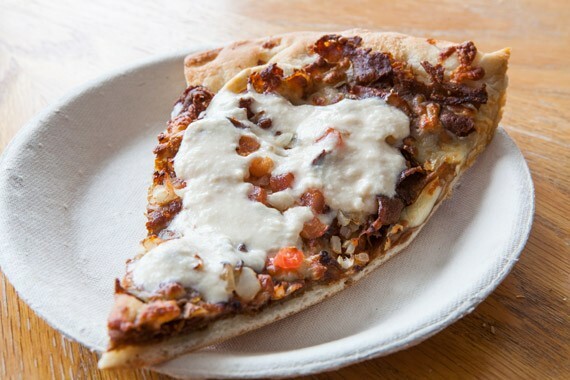 A kingdom built on donair--- which they claim is a sweet and spicy treasured artifact brought to Halifax from Greece---pizza isn’t an afterthought, but it definitely plays second fiddle to Halifax’s signature dish at KOD. Sure, the meat lover’s combo is a popular choice with their legions of fans, but at the end of the day, people just want that sweet rotisserie meat. Tony’s is like that reliable friend you can call up at any hour, with any crisis, and they’ll come running. That patient pal who’ll smile and nod as you rehash the same story again and again. We take ol’ Tony for granted sometimes, but there are few hours of the evening that this nearly 40-year-old pizza place isn’t at our beck and call, whether we’re stumbling through the doors happy to take any slice that’s available or dialling for delivery (which is crazy fast, FYI). For better, or worse, Tony’s has our back, and when it comes to pizza cravings...that’s really important. There’s a lot to love about Island Greek. Sure, it whips up quick and reliable pies, and yes, we’re not the only ones popping Lactaids and dreaming about its unbelievable Holy Cow (mozza, asiago, cheddar, feta and Monterey Jack on a sesame crust). 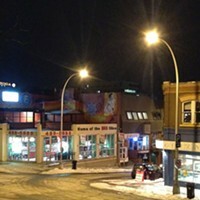 But this neighbourhood pizza place is also home of the gyro (that’s a yee-roh)---a wrap that easily rivals shawarma---home of $3.99 large poutine Wednesdays, a killer Greek salad, a seemingly bottomless paper bag of onion rings and a staff that’s as well versed in customer service as it is in cravings. Have a favourite that's not here? Join the conversation and share your go-to pizzeria in the comments. 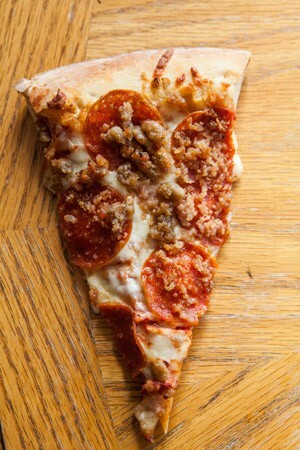 When the trio of pizza joints turned into a duo, did it put the nail in Pizza Corner’s coffin? Or is this Halifax legend unkillable? Laurel Harrington, the owner of Freeman’s Little New York, helps dissect the anatomy of a perfect plate of garlic fingers. And we've got our eyes on the pies. The pizza pies.